'Peeler block', 'lumber log', and 'de-limbed softwood tree-length' — strange, special terms from the world of logging. In the spring of 2013, at the first trial of Alexei Navalny, these words suddenly appeared on the lips of anyone interested in politics. The best-known representative of the Russian opposition, Navalny was facing trial in the city of Kirov, 900 km from Moscow. But the long distance did not prevent a significant number of supporters coming to observe; and most of the leading non-state publications covered the court hearings in detail. Together with Petr Ofitserov, owner of Vyatka Logging Company (VLC), Navalny was accused of stealing 10,000 cubic metres of timber worth 16m roubles (£190,000 as of 30/12/2014) from the state enterprise Kirovles in 2009, while he was adviser to the liberal governor of the Kirov Region, Nikita Belykh. VLC was supposed to have bought timber for less than the market price and Navalny apparently helped tie up the unprofitable contract. Navalny and Ofitserov were accused of misappropriation of state funds and embezzlement under Article 160 of the Russian Federation Criminal Code. Navalny and Ofitserov maintained that the timber had been sold at market price and that the 16m roubles declared as a loss by the state enterprise was the full price of the timber bought and paid for by VLC. On 18 July 2013, Judge Sergei Blinov handed down the sentence: Navalny was given five years of imprisonment and a 500,000 rouble fine (£5,600); Ofitserov received four years and a similar fine. Both were arrested in the courtroom and taken into detention. Later that day, however, several thousand Navalny supporters gathered in front of the State Duma in Moscow in spontaneous protest against the sentence. The police broke up the demonstration. The next day, 19 July, the Kirov court released Navalny and Ofitserov on the condition that they would not leave the city until the sentence came into effect (which would only happen in the autumn, when the Kirov regional court amended the prison term to a suspended sentence). One should not be too hasty in connecting the Duma demonstration to the sudden release of Navalny. The prosecution had already submitted its appeal against the sentence in the afternoon before people started to gather in the centre of Moscow. For many, this decision was linked to the upcoming Moscow mayoral elections scheduled for the autumn. There was a lot of talk about the incumbent mayor Sergei Sobyanin's need for a convincing victory over a real, rather than fictitious, candidate, and Navalny intended to stand, having registered as a candidate just before the sentence in Kirov was announced. 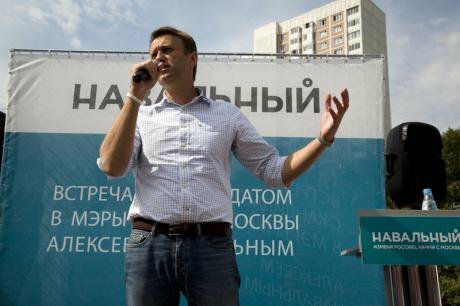 Navalny conducted an intensive election campaign upon release. The official election results on 8 September 2013 gave Navalny 27.24% versus Sobyanin, the incumbent, who won 51.37%. The following day, as supporters of Navalny demonstrated on Bolotnaya Square in central Moscow, Navalny announced that Sobyanin had received the percentage necessary to avoid a run-off — but only because the vote had been rigged. At the same time, Navalny announced that he was setting up a political party to fight for power and influence in Russia — the Party of Progress. 'I know that a toad on a pipe is afraid and jumps up and down because its feet are hot. I also know what I need to do now and we shall be doing it. We shall carry on working, finding like-minded people and bringing them on side. 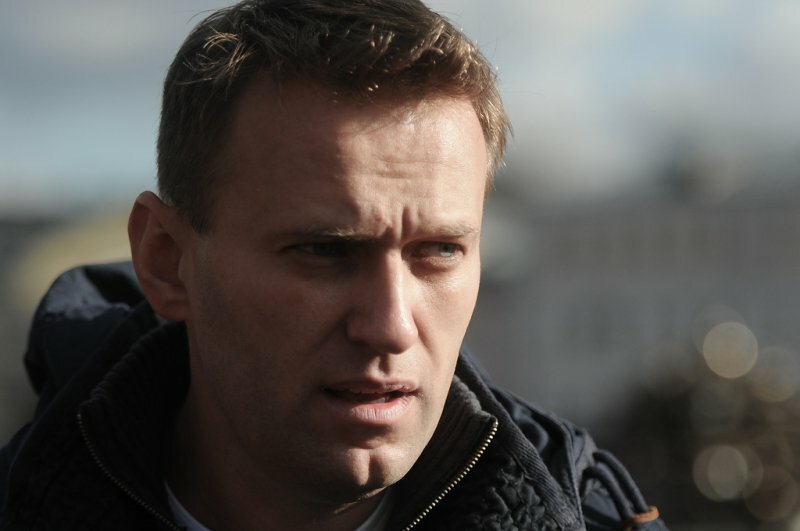 We will show that we are the main opposition force in the country,' Navalny promised. Six weeks later, at the end of October 2013, Alexei and his brother Oleg were officially charged in connection with the Yves Rocher case. Navalny and his brother Oleg, who used to work for the Russian Post Office, are accused of fraud in connection with freight transport agreements for Yves Rocher Vostok and the company MPK in 2008-2011. A firm belonging to the brothers (Glavpodpiska) was alleged to be a bogus company that offered services to companies at inflated rates, thus causing some 30m rouble (£339,000) financial losses to Yves Rocher and 4.4m roubles (£48,000) to MPK. In February 2014, before the Yves Rocher case came to court, Navalny had been placed under house arrest. The court banned him from leaving his flat in the Moscow suburb of Maryino, using the telephone, internet or post. The court allowed Navalny to communicate only with close relatives, lawyers and representatives from the official investigation team and the Federal Penitentiary Service. After a short time, the defence managed to get the ban on communication lifted: now Navalny was only barred from contacting witnesses in the Yves Rocher case, or commenting on the trial. 'From the very beginning I have said that I shall ignore this restriction, which is absolutely unconstitutional and absurd. I have no intention of keeping quiet about the fabrication of the case against me,' said Navalny in an interview with online current affairs journal Slon immediately after the lifting of the ban. The Russian Federal Penitentiary Service made two applications to the court to have Navalny transferred from house arrest to detention, citing Navalny’s flouting of the ban on using the internet and continuing to run his social network accounts. The court refused to approve these applications. As Navalny explained: his wife Yulia was running the accounts. In March 2014, the Prosecutor General’s Office blocked Navalny’s blog (navalny.livejournal.com) after discovering 'calls for mass unrest' on the site. When the Yves Rocher case did come to trial in May 2014, the location was a Moscow district court. Once more, unfamiliar terms were bandied about the courtroom — 'round trip', 'pallets', and some incomprehensible acronyms. On this occasion, however, only a handful of people and the occasional independent journalist attended the trial of the man who, during the 2011-2012 protests, had been hailed as a 'future president of Russia'. The brothers and their lawyers maintain that the investigation is trying to represent ordinary and legal business activity as criminal. During the court hearings, witnesses for the prosecution were unanimous in their agreement that they had suffered no losses. Yves Rocher carried out an internal audit, which showed that they also had incurred no losses from the collaboration with the Navalny brothers. In between the Kirovles and the Yves Rocher cases, Navalny acquired another conviction when he lost a whole series of lawsuits brought by state officials, whom he regularly exposes on his (as yet unblocked) website. In February 2014, Navalny lost a lawsuit brought against him by Konstantin Kostin for damages done to the latter’s honour, dignity and business reputation. Navalny had described Kostin — Chairman of the Foundation for the Development of Civil Society — as a swindler and was fined 500,000 roubles (£5,600). In April 2014, State Duma deputy Sergei Neverov brought charges relating to information on an extremely expensive dacha, published by Navalny (the court demanded that Navalny refute the information). On 22 April 2014, a Moscow district court found Navalny guilty of defamation and imposed a fine of 300,000 roubles (£3,400). This case emerged from a complaint made by the Moscow city lawmaker Alexei Lisovenko, whom Navalny described in a tweet as the 'drug addict deputy'. 'I am not a drug addict and I have a certificate to prove it,' Lisovenko said in court, waving his medical documents. Navalny countered that Lisovenko's habit of signing off messages 'sincerely, your Lis' (the Russian word for fox is ‘lis’) evokes a direct association with the internet meme 'Stoned Fox', for many a symbol of narcotic intoxication. In May 2014, Navalny's closest associates were subjected to police searches in connection with charges of fraud brought against him during the mayoral election campaign. According to the authorities, members of Navalny's campaign staff, Nikolai Laskin, Konstantin Yankauskas and Vladimir Ashurkov, each transferred 1m roubles (£11,300) to Navalny’s bank account just before the election. They then posted appeals on the internet asking people to transfer money to online payment service Yandex.money and other accounts to support his election campaign, and so recoup their own outlays. The investigation insists that Laskin, Yankauskas and Ashurkov stole something like 10m roubles (£113,000) from contributions by Navalny supporters. Yankauskas, a member of the Moscow city legislative assembly for the Zyuzino district, was placed under house arrest in connection with this case. Laskin, leader of the Moscow branch of Navalny's Party of Progress is not allowed to leave the country. The businessman Vladimir Ashurkov sought political asylum in the UK. In August, Navalny unmasked the head of the Moscow city transport department Maxim Liksutov for owning foreign assets, which led to a 600,000 rouble fine (£6,800) and another refutal. To round off this impressive collection of lawsuits, prosecutors have yet to press charges relating to the privatisation of the Urzhum spirit factory. But the investigation into Navalny's advertising company Allekt continues. According to the investigation, in 2007 this firm provided services to the liberal political party Union of Right Forces and, in the process, stole 100m roubles (£1,191,000) from it. The accusation is denied by both Navalny himself and the leader of the party at the time, Nikita Belykh. In June 2014, investigating officers once more came with a warrant for a search of Navalny's home, where he was under house arrest. They confiscated a drawing entitled 'The bad and the good man'. According to the officers, the painting had been stolen from a fence in the centre of the town of Vladimir and given to Navalny by Georgy Abdulov, a staff member from the Anti-Corruption Foundation, which Navalny himself had founded. Abdulov is accused of theft, and faces a possible sentence of five years in prison. The drawing found at Navalny's home was done by 66-year-old Vladimir artist, Sergei Sotov, who has been working as a yard-sweeper for the past 26 years, and drawing posters, which he puts up on fences in his home town. Sotov’s works poke fun at car drivers, dog owners, computer users and TV viewers. The Investigative Committee — Russia's main federal investigating authority — insisted that Sotov himself reported the loss of the picture and that the artist ‘incurred considerable damage as a result of the picture's disappearance'. In an interview, however, Sotov said that the policemen duped him – he was questioned for a long time, but only one or two questions were related to the lost drawing. 'I was handed the completed report, and I tried to read out the statement just in case I was signing a warrant for my own execution, but the handwriting was so bad that I couldn't make head nor tail of it. And the light was so dim ... I was in a hurry to get home because I was thoroughly fed up with the whole business. I am a trusting person, so I signed and left. Then it turned out I had signed a statement to the effect that I wanted to find the people who had stolen my picture,' admitted Sergei. The Investigative Committee recently announced the start of a new investigation into Navalny following the publication of an article by pro-Kremlin news site Lifenews. Entitled 'The Kremlin secretly financed Navalny,' this article states that Navalny received unofficial support for his election campaign when state officials brokered contracts with a company managed by the common-law wife of Vladimir Ashurkov, a key ally of Navalny. This money was later allegedly used to fund a Moscow book festival. The ever resourceful Investigative Committee, determined to get to the bottom of this latest affair, summoned prominent satirist and commentator Viktor Shenderovich, the poet Lev Rubinshtein and the writer Boris Akunin for questioning. Navalny had assumed that the Yves Rocher case would simply collapse in court, so that he and his associates could face new charges of secretly receiving money from the Kremlin. Yet the accusations of secret finance from the Kremlin are described as absurd — not only by Navalny, but by sources in the Kremlin as well. The court date for the Yves Rocher case — originally set for 15 January 2015 — had been heralded as a significant opposition event. Despite reported state interference in social media, a demonstration in support of Navalny was due to be held on Manezh Square, opposite the State Duma and the Kremlin. Judging by planned attendances on Facebook, the demonstration was set to be the largest opposition gathering since anti-war protests in September 2014. As momentum gathered in opposition circles ahead of this date, however, the local Zamoskvoretsky court in charge of the case announced on 29 December that the sentence would be issued on the following morning — two weeks earlier than planned. Finding the Navalny brothers guilty of embezzlement, on 30 December Judge Yelena Korobchenko sentenced Alexei Navalny to a three and a half year suspended sentence, and Oleg Navalny to three and a half years imprisonment and a fine of 500,000 roubles (£5,800). Alexei will also have to pay 4.8m rouble (£55,000) compensation to the Russian company MPK. Prosecutors had previously demanded a 10 year sentence for Alexei, and 8 years for Oleg. This is likely to be far from Navalny's final court appearance, and the suspended sentence and imprisonment of his brother still leaves the authorities plenty of room for pressuring Navalny, his relatives, and advisers.